Music Can It be Done? 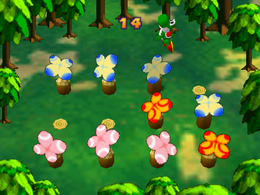 Ground Pound is a one-player minigame found in Mario Party. Before the game starts, the player has to look carefully at the pegs before the butterflies cover the tops. In order to win, the player must Ground Pound all the pegs with a flat top. Ground Pounding a peg with a pointy top injures the player and causes them to lose time. Sometimes, the butterflies do not cover the pegs completely, thus giving the player a better advantage. Game Rules – "Hip Drop onto the flat-topped posts. Try to remember which are flat and which are pointy, before the butterflies land." Advice – "Watch carefully. Look beneath the butterflies, and you'll see parts of the posts." The term "Ground Pound" wasn't used in the minigame descriptions in Mario Party and Mario Party 2. Instead the term used was "Hip Drop." This was changed to "Ground Pound" in the later Mario Party games. This page was last edited on April 2, 2018, at 13:24.